HAM AND CHEESE BREAKFAST CASSEROLE is our favorite make ahead breakfast for any special occasion. 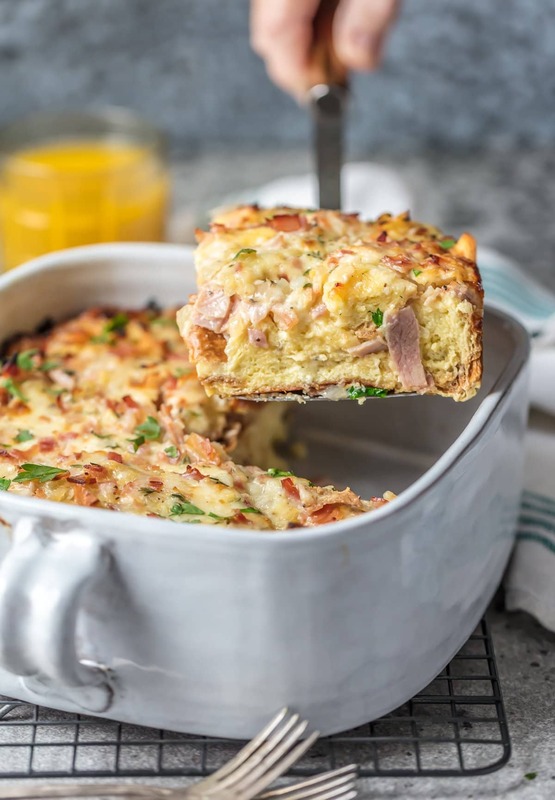 This easy breakfast casserole with ham, cheese, bread, eggs, herbs, and more is just so delicious! This cheesy ham and egg casserole is sure to please everyone and it’s just so easy to make! This ham and cheese breakfast casserole with ham, egg, cheese and more is an easy make ahead breakfast for busy mornings or weekend guests! 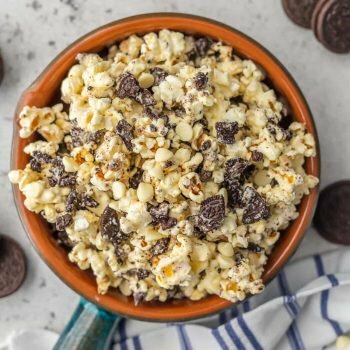 Welcome to one of my favorite recipes of the year! 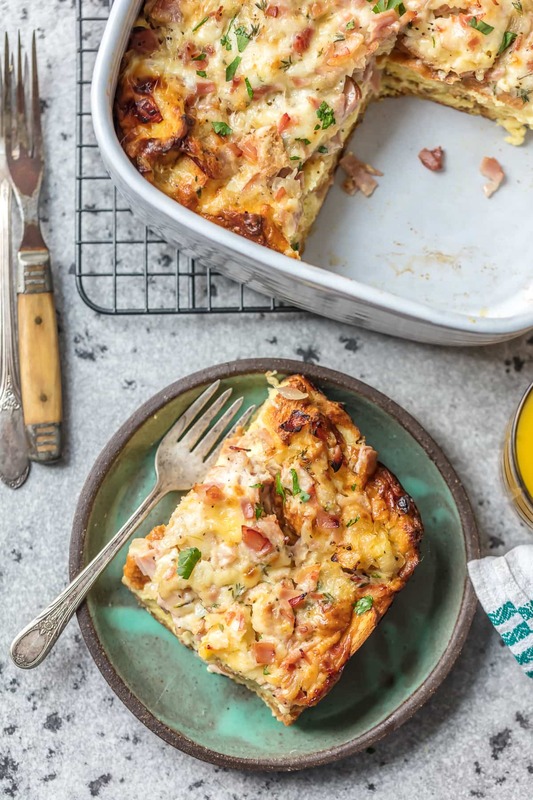 I am OBSESSED with this easy and amazingly delicious HAM AND CHEESE BREAKFAST CASSEROLE and I hope you love it as much as we do. It’s so hearty, creamy, SIMPLE, and bursting with flavor. I was excited about this ham and egg casserole from the start, but after eating it for about 4 mornings straight, I was even more excited! I just never seem to get tired of it. 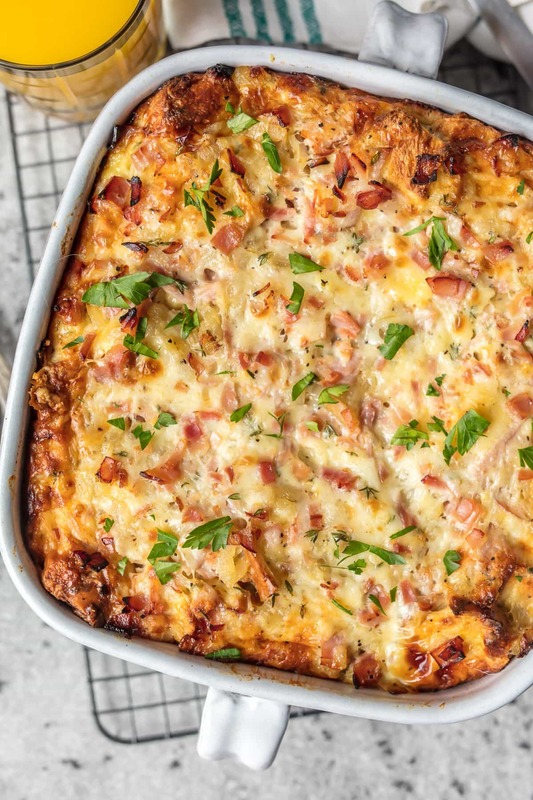 This ham, egg, and cheese casserole heats up like a dream, it is absolutely addicting, and it really fills you up for a full day ahead. You’re looking at my new go-to breakfast for any time friends or family come into town. This make ahead breakfast casserole with ham and cheese is just simply sure to please. Come on over! This Egg, Ham and Cheese Breakfast Casserole is the perfect make ahead breakfast recipe for all occasions! 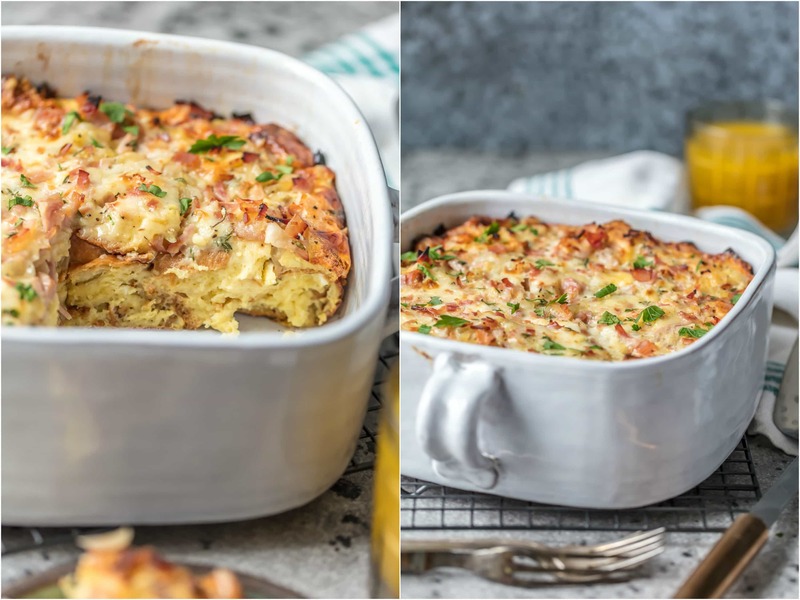 This Ham and Cheese Casserole is loaded with Challah Bread, ham, cheese, herbs, and eggs. It’s just so cozy and savory…a dream breakfast! I LOVE a casserole for breakfast because you can prep it the night before and just bake it when you’re ready to serve your guests or your family. Anything to make mornings easier is a plus for me. I’m no morning person! I’m always looking for quick and simple ways to make mornings delicious and simple. This breakfast casserole with ham and egg does it all! 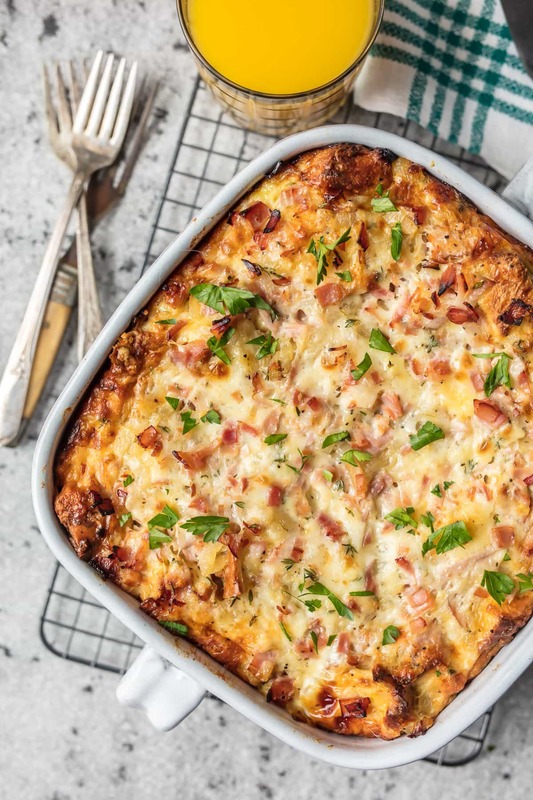 This easy make ahead breakfast casserole with ham, egg, and cheese is sooo delicious, so savory, and so simple to make. I love that you can prepare this ham and egg casserole the night before, let it sit in the fridge overnight, and then wake up and put it straight in the oven to bake! Of course you can make it and bake it all at once, but I much prefer to NOT cook first thing in the morning. If you don’t love ham, you could stuff this with whatever add-ons you love best! You could make it a veggie casserole, make it with spicy sausage, or even use pizza flavors. The sky is the limit and you can’t go wrong. I plan to try lots of different varieties, but I am partial to this ham and cheese version. Just simple flavors, prep, and big love. Make ahead recipes are my favorite, especially in the morning. When I have guests staying over, I really want to make sure they have a nice breakfast to wake up to…but I definitely don’t want to get up early to make it. This ham and cheese breakfast casserole solves that problem because you can prepare it the night before, keep it in the refrigerator overnight, and then just bake it when you wake up. 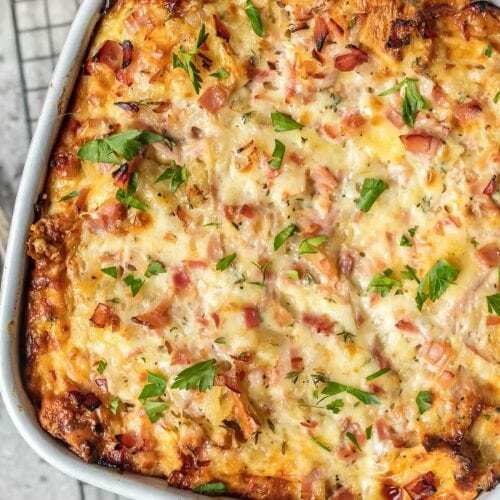 No early morning cooking, just simply heat up this breakfast casserole with ham in no time! I hope you give this Ham and Cheese Casserole a try and I hope you love it as much as our family does! 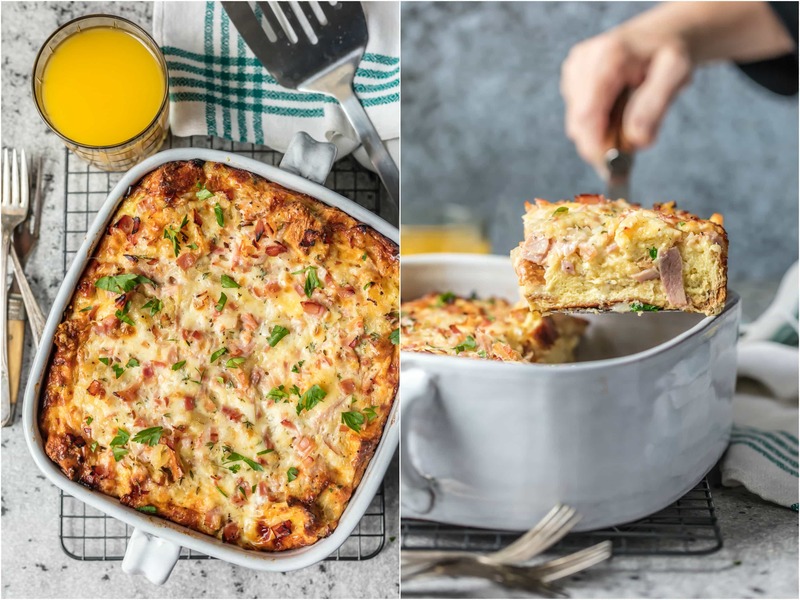 An easy breakfast casserole with ham, egg, cheese, bread, herbs, and more…so tasty! If you try other flavors and fall in love, please let me know. I’d love to hear about them. Watch the Video and See the recipe card for details on how to make Cheesy Ham and Egg Casserole. Enjoy! This HAM AND CHEESE BREAKFAST CASSEROLE is our favorite make ahead breakfast for any special occasion. 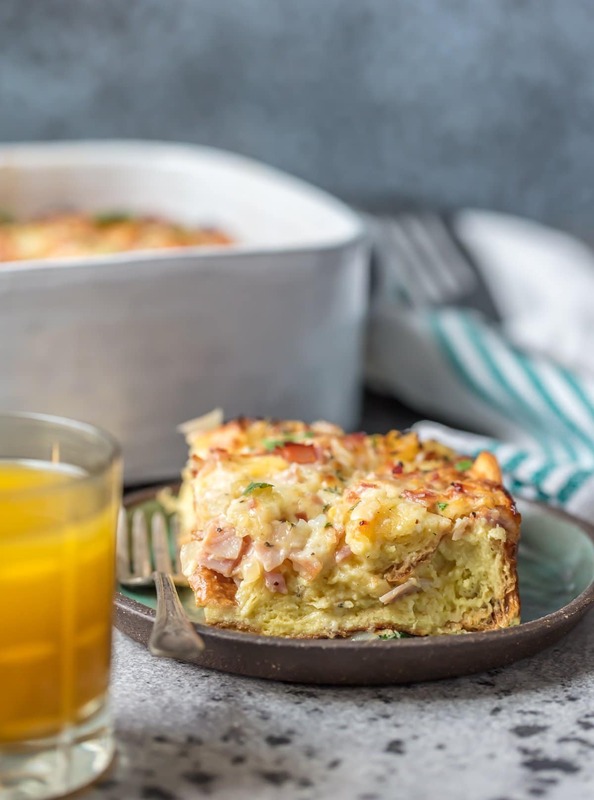 This breakfast casserole with ham, cheese, bread, eggs, herbs, and more is sure to please everyone and just so easy to make! 4 cups day-old, challah or brioche bread, cut into 1-inch cubes. Spray an 8-inch baking dish (1½-2 qt) with non-stick cooking spray. Spread the cubed bread in the bottom of the dish. Heat oil and butter in a large skillet over medium-low heat. Add diced onion, salt, black pepper and sugar. Sauté until onions are lightly caramelized, approximately 10 minutes. Be careful not to burn the onion. In a medium bowl, whisk together the eggs, half and half, dry mustard, nutmeg, thyme, salt and pepper. Spread the ham over the bread cubes, then spread the onion mixture on top of the ham. Layer on the Gruyere or Swiss cheese then pour the egg mixture over the cheese. Press down gently on the top to ensure all bread cubes get soaked with the egg mixture. Cover and refrigerate overnight. Before baking, warm the casserole on the counter for 15 minutes and preheat the oven to 350 degrees F.
Bake, uncovered, 40-50 minutes or until center is set and edges are bubbly and top begins to brown. A knife inserted in the center should come out clean. If casserole is browning too soon, loosely cover it with foil near the end of the cooking time. The casserole is delicious served any meal. Not a fan of ham, can you substitute sausage? Hi there. Would this great-looking casserole work if I made it about a week ahead, froze it, then re-warmed it in the oven? Having a brunch the day after my daughter’s wedding, and I’m thinking this would be perfect. If yes, what degree oven would you use and for how long? Thank you! Oh my gosh this looks SO GOOD!!! I’ll have to keep it in my think tank for Easter. How delicious!!! I have so much ham in my freezer that I need to use! This will be great! Also I envy your photography. It’s so beautiful! So tasty and amazing i love this. Thanks for sharing and rocking my party with this amazing idea. This was easy and tasted great. I added some green pepper and some red pepper flakes which we prefer things a little spicy and it turned out very nice. Really looks good. I am going to make this for my Sunday breakfast tomorrow. 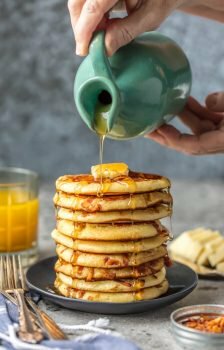 Wow, it’s great for the breakfast, thanks for sharing the recipe!